Steering, Anti-Allergen Complete Seal and other technologies. Motorized floor nozzle based on DuoClean technology is combined with flexible cleaning hose and several cleaning attachments for cleaning various surfaces from the floor to the ceiling. And it comes at very acceptable price, even when not on sale! DuoClean Technology: Motorized floor nozzle features two brushrolls. A bristle brushroll is designed for deep cleaning of the carpeted floor, while a soft brushroll is designed to pick larger particles off the floors. Two brushrolls combined with strong suction improve cleaning when compared with earlier designs, reducing the number of required passes and thus speeding the cleaning task. Powered Lift-Away: with a press of the button Lift-Away pod can be detached from the rest of the vacuum. This gives the user the ability to clean under, around and above furniture, appliances and other objects with greater ease, regardless if the motorized floor nozzle is used or one of available cleaning attachments. Advanced Swivel Steering combined with strong LED headlights, enables the user to easily maneuver around the objects on the floor. Shark NV803 weighs 14.5 pounds (~6.46 kg) and although it is not lightweight unit, it is easy to move around the floors and even traverse different floor types. LED headlights help with cleaning in low light conditions, like under the beds or furniture. Also, they help spot the dirt on bare floors even during the daylight, speeding up the cleaning. Shark NV803 traps 99.99% of 0.3 microns or larger particles, effectively removing dust, pollen and other allergens from the exhaust air – very important for all users, not just for pet owners, families with kids or people having asthma and allergies issues. Fingertip controls are positioned on the handle and they allow the user to switch between various cleaning modes. Since this is Lift-Away unit, main power on/off switch is on the Lift-Away pod. Upright mode: This is most common mode of operation. Vacuum is as classic upright vacuums and used for cleaning floors, regardless of the floor type. Lift-Away mode: In Lift-Away mode, Lift-Away pod is detached from the rest of the vacuum and used for elevated surfaces like stairs, bookshelves, desks, ceiling fans, blinds etc. Lift-Away pods weighs around 6.4 pounds (~2.9 kg) and can be carried in one hand, while cleaning is done using other hand. Canister mode: When Lift-Away pod is attached to the canister caddy, Shark NV80* series effectively becomes classic canister vacuum cleaner. In this mode, vacuum is used for cleaning both floors and elevated surfaces. However, canister caddy is sold separately, which isn’t that bad – most people prefer upright mode for cleaning flat floor surfaces anyway, and canister caddy would just collect the dust and increase the initial price of the vacuum cleaner. Uprights vs Canister Vacuums? 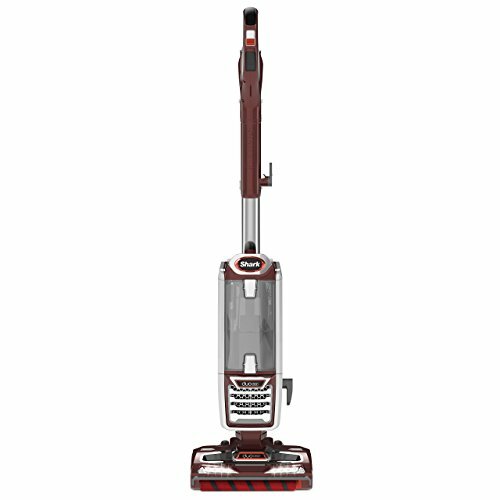 If you were indecisive which vacuum to buy, upright or canister, Shark NV803 solves this dilemma. Shark NV800: Pet multi-tool, Duster crevice tool. Shark NV801: Pet multi-tool, Duster crevice tool, Under-appliance wand. Shark NV803: Pet multi-tool, Duster crevice tool, Under-appliance wand, Pet power brush, Accessory bag. Shark UV810: Pet multi-tool, Duster crevice tool, Under-appliance wand, Pet power brush, Accessory bag, Flexi crevice tool, Precision duster. Note: Last model is ‘UV810’, not ‘NV810’, again, according to the official Shark’s website. Although individual cleaning attachments can be purchased later when required, when they come with the vacuum itself, they are cheaper. Pet multi-tool combines stiff bristle brush and upholstery tool in one multi-tool. Stiff bristle brush removes stubborn debris from different surfaces while the upholstery tool is design to clean pet hair and other hard-to-remove dirt and debris from upholstery and similar surfaces. Duster crevice tool combines soft dusting brush and crevice tool. Dusting brush uses soft brush to agitate dust and other small particles off the sensitive surfaces, which are then collected by strong air flow into the vacuum. Crevice tool is designed to clean narrow and often hard-to-reach areas, like edges, corners, between cushions, along the baseboards etc. Under-appliance wand effectively clean under, around and behind hard to move furniture, appliances and other objects. The extension part can be flipped over to clean the underside of cleaned objects. This is very useful cleaning attachment, and when being used for the first time, it can collect rather large amount of dirt and various long-lost smaller objects. Pet power brush is designed to pick up pet and human hair and different loose debris. It does the same job as the Pet multi-tool, except that it is little bit more ‘aggressive’ onto the surface. It cleans deeply embedded dust, hair, and other dirt from the upholstery, stairs, and other surfaces. IMHO, Shark NV803 represents the best buy option of whole NV80* series, especially when found on sale. Motor draws 9.5 Amps and is rated at 1150 W. It provides plenty of suction, regardless of the cleaning mode or used cleaning attachment. Power Cord is 30 feet (~9.15 m) long and provides long reach using single wall power socket. Unfortunately, NV803 doesn’t come with the power cord automatic rewind system. Power cord is stored on the wrap hooks on the vacuum’s sides. Note that power cord automatic rewind mechanism would simplify the use of the vacuum, but it would also increase mechanical complexity and also the weight of the Lift-Away pod. Weight of the vacuum in upright vacuum mode is 14.5 pounds (~6.6 kg), while Lift-Away pod weighs 6.4 pounds (slightly less than 3 kg). Air filters: NV80* series come with three air fitlers – pre-motor foam filter, pre-motor felt filter, and post-motor HEPA filter. ​Note: filters are washable and design to last lifetime of the unit. Should something happen to the filters, replace them with new OEM filters. Dust Cup capacity is 0.9 quarts (~1 liter) – capacity could be larger, but dust cup is easily emptied. It is recommended to empty the dust cup after each use. Physical dimensions of the unit are (LxWxH) 11.8×11.9×46.1 inches (~30 x 30.2 x 117 cm) and the cleaning width of the motorized floor nozzle is 8.5 inches (~21.6 cm). Warranty: 7-year limited warranty, which is very good. Note that belts and filters are designed to last a lifetime of the unit, so there are no hidden operational costs. Should something happen to these parts, always replace them with OEM spare parts. Shark NV803 is simple unit to operate, but since there are few specific procedures, it is highly recommended to read the manual/instructions upon unit’s arrival. Shark Rotator NV752 Powered Lift-Away TruePet Vacuum is older Shark’s Lift-Away vacuum, which is also designed to be used as the main vacuum cleaner even in larger homes and apartments, just like newer Shark NV803 DuoClean Powered Lift-Away Speed vacuum. More about Shark NV752 can be found in our Shark Rotator Powered Lift-Away NV751, NV752 and NV753 Vacuums – Comparison and Recommendation article (link opens in the new window). Both Shark NV752 and NV803 can be used as classic upright vacuum cleaner, as Lift-Away vacuum and as canister vacuum cleaner using optional canister caddy. ​that Shark NV752 can cover larger area faster, but it also requires more passes to clean deeply embedded and stuck-on debris than Shark NV803. Power cord length is the same – 30 feet. Air filtration in both units is very good, but NV803 comes with slightly better air filtration – 99.99% vs 99.9% of 0.3 microns or larger particles. NV752 comes with larger dust cup – 1.4 dry quarts vs 0.9 dry quarts. This is ~50% difference and can be important when regularly cleaning heavy soiled floors. Both units have strong LED headlights, but NV752 also comes with LED lights on the handle, which can be important when the unit is used in Lift-Away and canister modes, without motorized floor nozzle. Available cleaning attachments are similar, but not the same. Both models come with Pet multi-tool and Duster crevice tool. Also, NV803’s Pet Power Brush is similar to NV752’s TruePet Motorized Brush. But, NV752 comes with Hard Floor Genie and NV803 comes with Under appliance wand. Since NV803 comes with DuoClean motorized floor nozzle, it doesn’t require attachment optimized for hard floors (like NV752’s Hard Floor Genie), but Under appliance wand can be very useful in many situations. IMHO, NV803 comes with better set of cleaning tools and attachments – not by large margin, but nonetheless, important one. ​Long Story Short: Shark NV803 DuoClean Powered Lift-Away Speed Upright Vacuum combines several important features in one single, versatile unit. It is not the cheapest upright vacuum on the market, but considering all the options, it is rather affordable solution for keeping whole home clean.